During the pre-flop betting round, each player has to choose from among three options - raise, call or fold. Some players would have you believe there are only two decisions - raise or fold - and that calling is always a bad move. Calling is not a bad play. This article will look at instances when calling a pre-flop raise is justified. The strategies in this article are based on a nine-player game. Early position is considered Under the Gun (player to the left of the big blind) and UTG+1. UTG+2, UTG+3 and Hijack are considered middle position, and Cutoff, Dealer (button), Small Blind and Big Blind are considered late position. This article is not about limping (i.e. just calling the Big Blind when there have been no pre-flop raises). This is about calling a pre-flop raise. There is a big difference between limping and calling a raise. There are many factors that come into play when deciding to call a pre-flop raise. The first thing to note is the position of the raiser. If the player is from one of the two early positions, it should be an indication he has a really strong hand - a monster pocket pair (AA, KK, QQ and maybe even JJ) or a suited Broadway (A-K, A-Q, A-J and possibly K-Q or K-J). If you're going to call, you need a pocket that plays well against this type of hand. Aces with medium or low kickers are not advisable, because you are likely going up against an ace with a much better kicker or a high pocket pair. Let's say you have A-8 off. Against this pocket, A-K suited is a 73:22 favorite to win, and pocket jacks are 72:28. 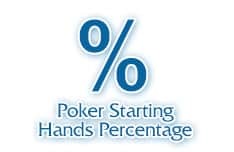 In other words, you are dominated by any hand that should be in his pre-flop raising range. Suited aces don't fare much better. Pocket jacks are 68:32 against A-8 suited, and A-K suited is 69-27 against the same pocket. Slightly better, but still dominated. However, the odds shift significantly for suited connectors. Let's say you have 10-9 suited. AK suited is still favored, but the odds drop to about 61:38. AK off is even lower at 59:41. The odds are similar all the way down to 5-4 suited. A pocket pair dominates suited connectors, so you have to be careful playing this kind of hand. But if you think your opponent is playing a monster ace, then it might be worth making the call. Unless you are calling from one of the blinds, you will have the advantage of position on subsequent streets. If the early raiser comes out firing after the flop and you whiffed, it's an easy decision to fold. If he checks the flop and you whiffed but maybe have a backdoor straight or flush draw, you can decide to take a free card to see if that improves your hand. If you're deep stacked and confident in your ability to play with position, suited connectors can pay off against monster pockets. 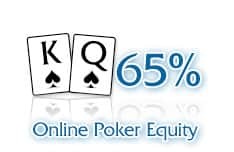 If the pre-flop raise comes from a middle position, then it is reasonable to expect this player's opening range has expanded slightly compared to the early position raises. In middle position, players will open with medium pocket pairs, suited aces, even hands like J-10 suited. As a result, the kinds of poker hands you should call with also expand. Aces with weak kickers are back in play as are medium pocket pairs. If the pre-flop raise comes from late position (cutoff or button), the player may be attempting to steal the blinds. Calling with second tier hands (like K-8 suited, medium pocket pairs and any ace) is reasonable here. This is when intelligence on your opponents is vital. Keep an eye on how many times the players to your right raise from either the button or cutoff, especially if it has folded to them. If they are a serial blind stealer, then calling to see a flop could pay off, as they may be opening with less than optimal hands. You also want to watch how many times they make a continuation bet (C-bet) after the flop. Players who try to steal lots of pots are prone to making lots of C-bets. One pattern to watch for is a pre-flop raise, C-betting the flop and then checking the turn. A final note about position is to remember if you call from the big blind (or the small blind and the big blinds folds), you will be playing out of position on subsequent streets. If you are not confident in your ability to play out of position, then folding might be your best move. The size of the bet needed to call should be another major consideration. Calling is most likely an acknowledgement you are behind in the hand. Therefore, don't risk a significant amount of chips entering hands in which you suspect you trail. In a multi-table tournament, the standard pre-flop raise is somewhere between two and three blinds (early in a tournament, when blinds are low, raises can be in the 5-6 BB range or even higher). Late in a tournament, effective stack sizes are smaller and every chip is precious. Protect your chips and focus on playing premium hands. You can take a few more chances but don't be too loose. Do you have a large stack? If your stack size is less than 30 BBs, calling pre-flop should almost be eliminated from your repertoire. 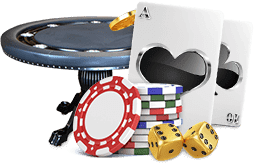 You don't want to risk 10 percent - or more - of your stack playing a hand where you need to hit the flop to have a reasonable chance of winning. You need to be protecting your chips and should focus on playing premium hands and taking advantage of position. 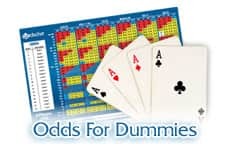 If your stack size is more than 30 BBs, you've got enough flexibility left to take a chance on a hand every once in a while, but you don't want to be loose with your chips. Pick your spots judiciously in these instances. You need to have a reasonable expectation that the post-flop action will be down to two players. 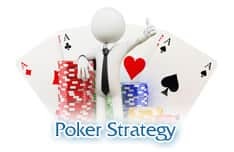 You want to avoid finding yourself in multi-way pots with draw-heavy hands. If you have one of the larger stacks at the table, then you can loosen up and take more chances. A final consideration when deciding to make a pre-flop call is the stack sizes of the opponents who have yet to act. Be wary of the short-stacked (10 BBs or less in tournaments or about 25 percent of the minimum buy-in for cash games) players. They are apt to go all-in at any moment. There is nothing worse than putting chips into a pot and not seeing the flop.